Clear brown-amber with a thin, off-white ring. Smell is brown toast, grass and corn. This has nicely toasty, nutty malt flavors with semi-sweet corn and hints of grape and light wheat. Depth and complexity of flavor still leave room for plenty of easy drinking. The round body has a light, crisp froth, finishing with a semi-dry tingle. Poured a copper color with a one finger white head that dissipated quickly to nothing. No lacing. Aroma was almost non-existent except for a peculiar mint overtone. As it warmed a bit a sweetness arose. The taste is hop forward with the malt taking a back seat. The flavor is a bit grassy. I am wondering if it is too cold. This brew is a bit thin and wet, with light carbonation. After comparing my experience with other reviews, I am disappointed. I was expecting more. It was not the freshness. Perhaps I am off today. Rich, malty, sweet, this is one outstanding Maerzen. Pours a clear dark copper color, with a thin white head that settles rapidly without a trace. Aromas and flavors are unabashedly malt forward. Tons of dark bread and caramel, with notes of honey and herbal hops and a hint of molasses. Very sweet on the palate, with a mouthfeel that is on the silky side. Bitterness is quite low. Sweet finish that lingers on the tongue. I'd have preferred to drink this with some hearty food, such as a bratwurst or a greasy burger. As a stand-alone beer, it's better when cold. Dollar bargain bin find! Leah and I are not lager fans in general, but this caramelly offering was enjoyable! It pours a dark amber/red color with a very small white head. Smells of toasted malts and sweet caramel. Taste follows the smell. An easy drinking lager with a small malty backbone and a touch of sweetness to finish. This beer poured a dark copper color with a thin white head that disapated quickly. The aroma was sweet and bready with a hint of toasted malt and a bit of nuttiness. The initial taste is the toasted malt that picks up some happiness in the middle. It finishes with a smooth nutty aftertaste. The beer is so well balanced that the beginning and middle are not all that discernible from one another. The finish is what stands out the most though. The nuttiness blends exceptionally well with the toasted malt notes. There is a slight hint of alcohol at the end that has some nice sweetness as well. The mouth feel is well-balanced and quite smooth. Overall, this is a really good example of an Oktoberfest with some subtle deviations that really make this beer standout from others within the style while still maintaining its most important characteristics. Nice pour, a little head that lasts, pretty amber color. Fizzy on the tongue, with a balanced taste. I like the little bit of a bite in the aftertaste. Lighter and milder than I usually like in a beer, but overall a winner. I'll be drinking the rest of it with a meal, instead of after. And it does not seem like it has 6%ABV, so it might sneak up on you if you aren't drinking it with food. Pours true amber, 9,10 on the srmn chart. Tan head of creamy foam that fell well. Clear and bright. 6% abv. Hops are sweet floral and spice. A bouquet on the nose. A little alcohol on the nose too. It smells sweet but tastes sharp. Malt is rich and has an earthy hearty scent. Rich and smooth. Drinks mellow and smooth with plenty of peppery spice to tickle from hops. Soft middle and richly malty. Hops stay herbal and grassy and in the background except for a nice brisk bitterness to finish it. A little warming from alcohol much like the vienna style lager. Crisp bubbles show you the browned crust on some bread at the end and a lasting hop bitter. Barktoberfest | Thirsty Dog Brewing Company. Poured from the bottle into a pint glass, this beer's head is two fingers thick, with lateral lacing, and an amber-fading-into-gold body. Smells like plentiful malts and hearty grains. I'm tasting those malts and grains, along with a nice mild sweetness. 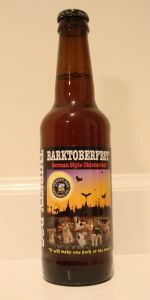 Overall, I'll choose to give Barktoberfest | Thirsty Dog Brewing Company a 4.5. This is different(in a good way) from most Märzens out there.